Windows operating system is very flexible and easy to use operating system, this OS is packed with lots of features so one can easily operate this and complete toughest task with ease. But along with many features, sometimes Windows system start displaying the error message or gets unable to boot. When a user tries to boot Windows system then instead of booting it prompts Windows boot manager error 0xc000000f on the screen. This error appears every time when the user tries to boot their system. This situation is very difficult for the user because due to 0xc000000f error user gets unable to access their data from the system. So that it is necessary to fix this issue as soon as possible. Hard disk Corruption or failure may also generate this error. There are lots of tricks available through which you can fix Windows error 0xc000000f, apply the below-given methods or tricks to get rid of Windows error 0xc000000f. Step 1: Boot your system Restart your computer and use bootable DVD/USB to boot it. Step 2: Press any key from your keyboard if asked by the system. Step 3: Choose the language, time, currency and keyboard and press Next. Step 5: After it, in the System Recovery Options, choose the Command Prompt. Step 6: In the command prompt, type bootrec.exe and press Enter key. This command will rebuild the BCD and your computer will become normal. 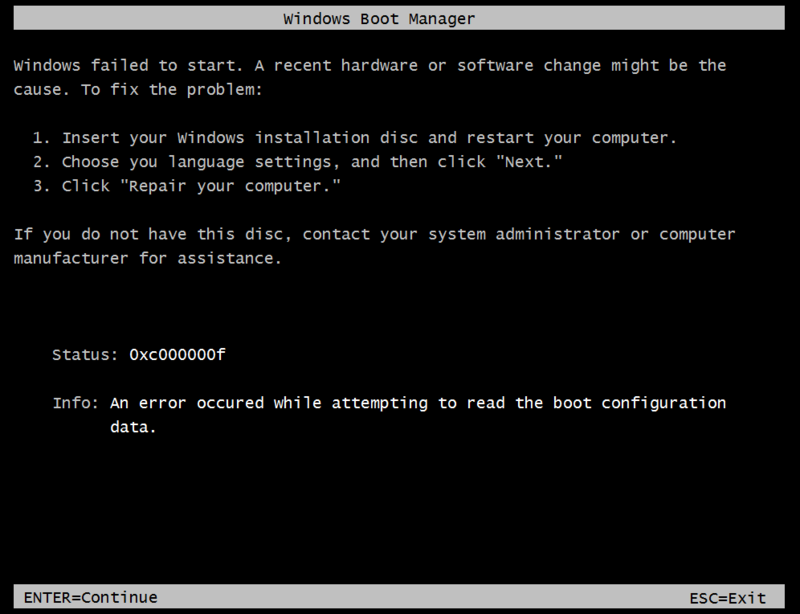 Again boot your system with the help of bootable DVD and select the repair option. At the recovery console type “diskpart” and hit enter and then type “list disk”. This will display the list of physical disks attached in the system. After it, type “detail partition” and find where it says “Active”. If it display yes then move onto the next section otherwise type “Active” and hit enter, Windows will display a message ‘the partition is now marked as active’. Restart and boot into the recovery console again. After executing the above given command, again reboot the system into the recovery console and type “bcdboot path to your windows folder” (for example: bcdboot c:\windows). This command will build a new bcd boot store and copy over all boot files required to boot. At last, reboot your machine again and it should work. Step 2: Choose your preferred language, time and keyboard input. Then click on the Repair your computer option. Sometimes the hard drive or system partition’s integrity gets compromised due to the several causes. In order to fix this issue, go with the built-in Windows CHKDSK utility. This tool will scan the disk and fix all the file system errors. Step 1: Boot your system with the Windows install disc. Step 5: Run the following command and hit the Enter key. Note: Here, you have to replace the C: with the system drive letter where Windows is installed. This application is one of the best and effective ways to maintain your Windows system. This software contains an easy to use interface so that one can easily operate this tool without any need of professional skill. Want to fix Boot/BCD 0xc000000f Error for Windows XP, Vista, 7, 8, 8.1, simply follow the given solutions and make your system error free. How to fix Error 0x803f7000 in Windows 10 Store?